Neurofeedback is a type of treatment that uses a computer to measure brainwave activity and teach a person to change the way in which their brain actually functions. The process involves attaching sensors to a person's head to measure the electrical activity of the brain--much like the process when a thermometer is used to measure temperature. Information about the functioning of the brain is then presented on a computer monitor. The person watches the monitor and learns to change the way in which their brain functions. An analogy of how neurofeedback works involves the process of a person combing their hair. The person looks in a mirror as they comb their hair. The visual information (feedback) from the mirror allows the person to position the comb correctly so that their hair is combed in a desired manner. Likewise, watching the monitor with information about how one's brain is functioning allows a person to shift non-useful patterns of brain function into patterns of brain function that support effective everyday life activities. The process of learning neurofeedback, like combing one's hair, is relatively easy. However, practice is required to learn new patterns of brain function and new ways of performing desired skills. Neurofeedback has been researched and used most extensively in the treatment of ADD/ADHD. A recent study of 1089 individuals (who were mainly children) with ADD/ADHD found the training to increase scores on a standard test of attention for 85 percent of the people in the study. * Results at work and in the classroom may vary. It also has been used to treat other conditions such as depression, anxiety, anger control problems and brain injury. 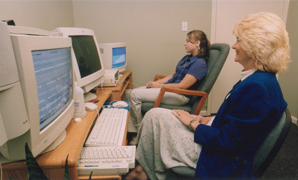 We frequently use neurofeedback along with other treatments for various conditions. For example, a child with reading problems may need reading tutoring along with treatment in our clinic. Treatment of a complex problem like traumatic brain injury may involve traditional cognitive rehabilitation efforts, individual and family psychotherapy along with neurofeedback training. Individualized treatments are designed with the components that have been shown to be most effective for specific conditions. Some clinicians and researchers have reported remarkable success in the treatment of ADD/ADHD with neurofeedback. Others still consider neurofeedback to be an experimental procedure. A particuarly useful source of information about the procedure can be found at the website of EEG Spectrum International. Also, please feel free to contact us for additional information. * Kaiser, K., & Othmer, S. (2000). Effect of Neurofeedback on Variables of Attention in a large multicenter trial. Journal of Neurofeedback, 4(1), 5-14.